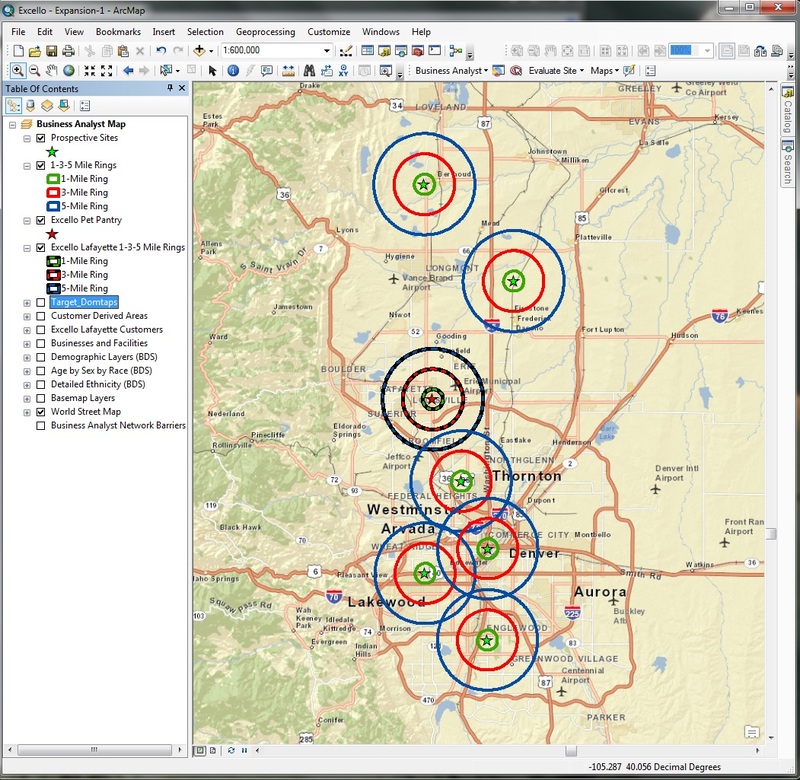 Excello approached GeoWize for decision support data for their business site selection process in the Denver, Boulder, Longmont area. 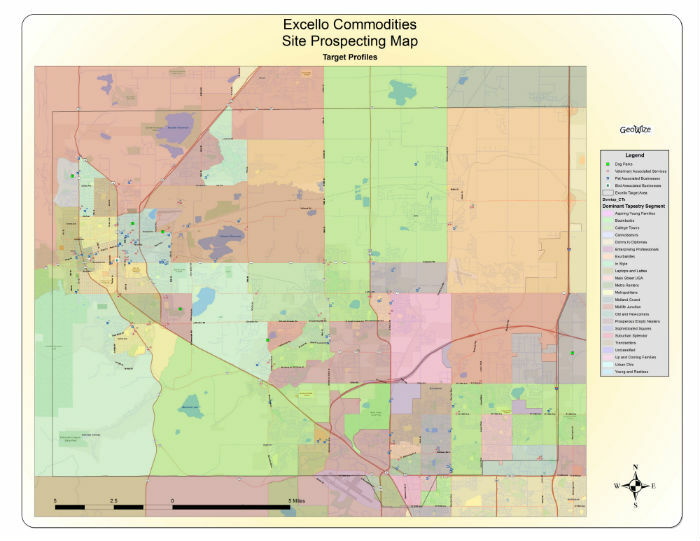 Excello Company Overview Excello Commodities, Inc was founded in 1955 and purchased by the Ervin family in 1976. The Ervin family still operates Excello today, providing the finest products and service at the best possible value. Excello has specialized in the finest seed blends for birds, livestock, and small animals for nearly 6 decades. In 2011 Excello decided to expand from strictly wholesale to a retail pet supply outlet. Elaine Ervin, of Excello Commodities, contacted GeoWize in 2011. The initial request was to perform a market potential analysis to identify potential target locations in the north Denver metro area where they could start searching for usable real estate for their first retail outlet. The Business Site Selection Solution Elaine needed to be able to visualize the decision information in a way that would allow her to see where she should start shopping for appropriate real estate. For this purpose, a set of thematic (color-coded) maps displaying the required expenditure, demographic, and profile information, along with the location of competitors and complementary businesses and sites would be required. Additionally, support tables with detailed information on competitors and complementary businesses and sites would be needed. Pet Expenditures Map – A thematic, color-coded representation of total pet expenditures for each census block group in the entire study area was displayed on a large-format map. The map legend shows clearly the data that is displayed on the map. Unique symbols were used to differentiate dog parks, veterinary clinics and associated services (complementary businesses), pet associated businesses (possible competitors), and bird associated businesses. 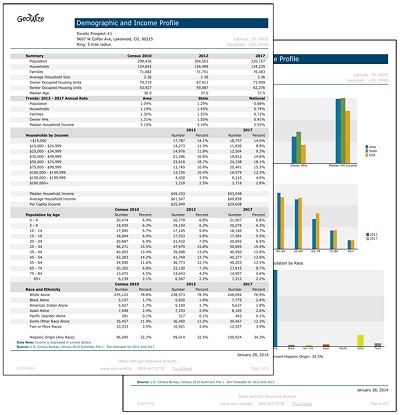 Below is an example of the business data included in the accompanying Excel workbook. A yellow (low) to dark brown (high) color scale was used to thematically represent total pet expenditures for each census block group. Essentially, the darker the color represents a higher potential for success; the lighter the color is, the lower potential for success. Target Profile Map – A large-format, thematic, color-coded representation of the target dominant tapestry code for each census block group in the entire study area was displayed on a large-format map. 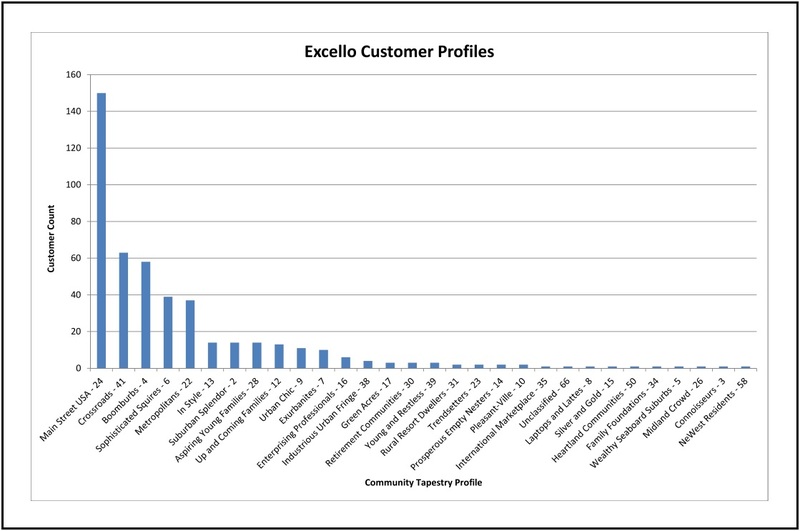 On the initial Excello market evaluation study, there was no existing customer data. A keyword search was performed on the Tapestry Segmentation Reference Guide from Esri (Environmental Systems Research Institute) to find profiles of pet lovers and owners. 23 profiles included preferences supporting pet ownership. 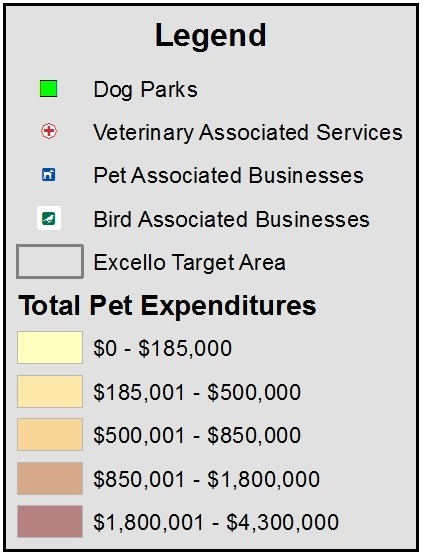 As with the pet expenditure map, dog parks, veterinary clinics and associated services, pet associated businesses, and bird associated businesses are also shown on this map. 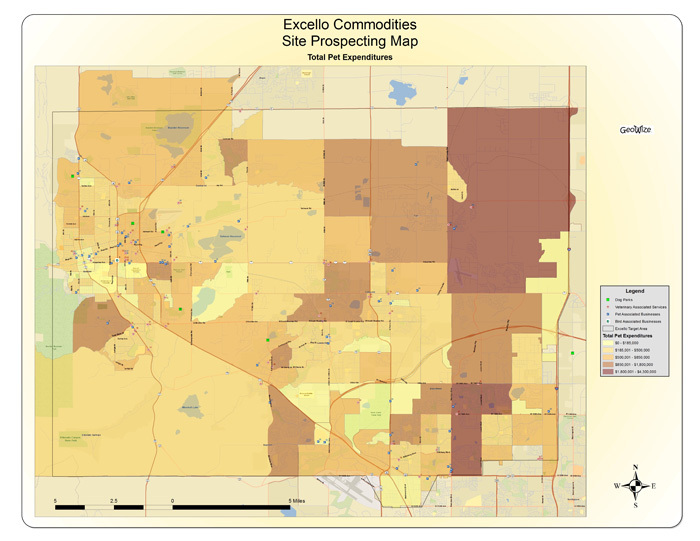 By using both maps and the supporting Excel workbook, Excello was able to find target areas with the highest potential. Using standard industry codes, our database of sixteen million US businesses was searched to find both competitors, such as pet supply stores, and feeder businesses, such as veterinarians and boarding kennels. The businesses were uniquely identified by business type, and supported with a keyed list providing details on each business. The first retail outlet is open and successful; now Excello wants to expand and open a new retail outlet in the Denver region. Elaine provided five potential locations for analysis. Additionally, there was now current customer data to use for profiling. Having existing customer location data allowed us to add a powerful element to our analysis. First, we could accurately define the target trade area for our analysis by using the existing customer locations to be used in an algorithm for calculating the trade area. Additionally, the customer locations could be used to identify target Tapestry profiles. Now, rather than guessing at demographic, socioeconomic, residential, & behavioral characteristics of prospective customers, the characteristics of actual customers could be used to map the locations of similar prospects. These factors, coupled with market research reports, and a competitive analysis would provide Elaine with the decision support information that she could use to make the “right” choice for a successful expansion location. 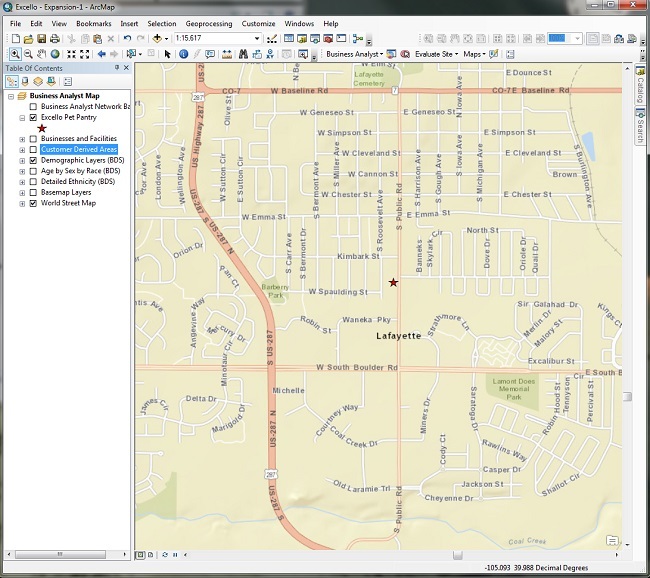 Identify Current Location – Using the address of the first Excello retail location in Lafayette, Colorado, plot the location on a map. 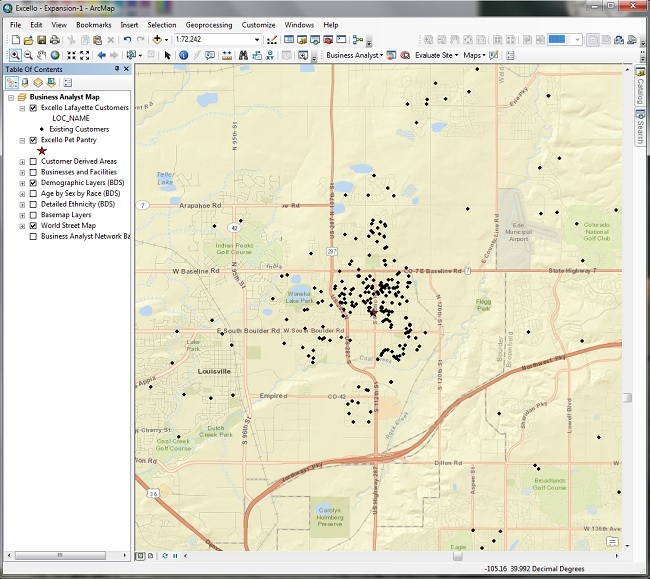 Plot Current Customers on a Map – Take the list of existing customers; scrub and condition the data; derive the longitude and latitude coordinates from the address information (geocoding); and plot the customers on a map. Derive the target trade area from the location of the existing store and the existing customers. First, the areas containing 40%, 60%, & 80% of the existing customers were identified. Then, standard 1, 3, & 5 mile rings were overlayed on the map. Visual comparison of the rings showed that 80% customer area correlated closely with the 3-mile ring. 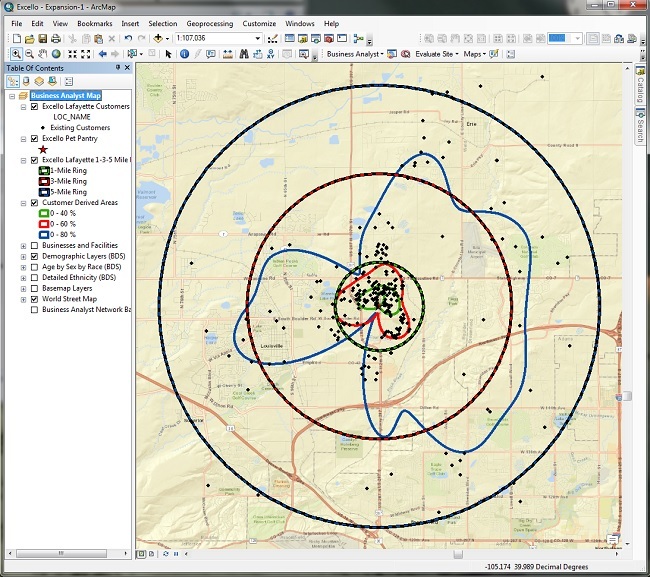 From this analysis it was determined that a 1, 3, & 5 mile ring analysis should be performed for each prospective site. Identify Customer Profiles – Join the Tapestry profile information to the existing customers, and graph out the count of each profile to derive the target profiles. 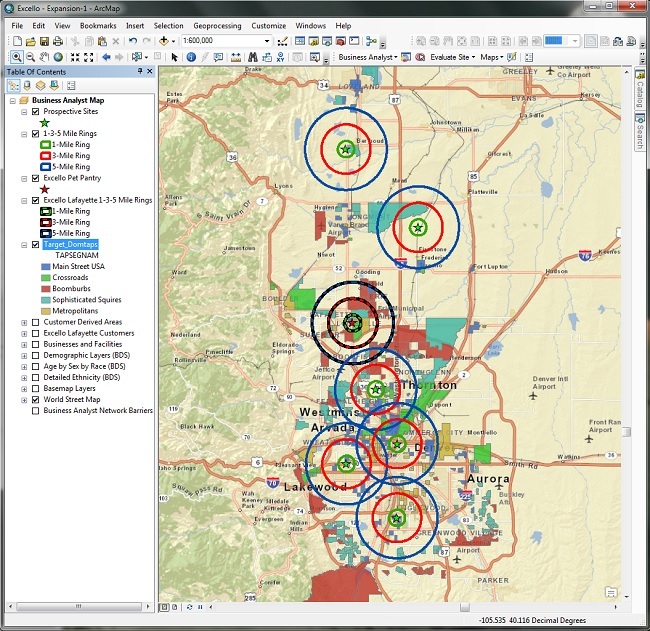 Map the prospective sites and define the target trade area around each site. Overlay Tapestry profiles onto prospective sites – Map target profile areas at the census block group level. This allows us to find a location with the greatest number of potential customers. 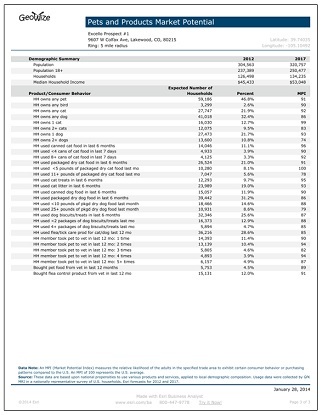 Census 2010 Population, Households, Families. Average Household Size, Median Age and Owner and Renter Occupied Housing Units – Who was there in 2010. 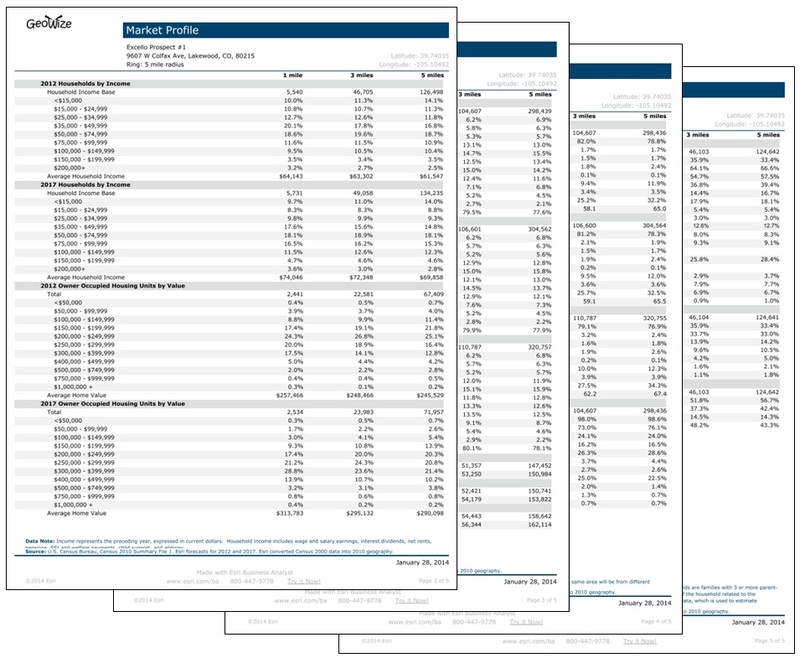 Current-Year and Five-Year Forecast Annual Rates for Population, Households, Families, Owner Households, and Median Household Income – How fast will it grow. Current Year and Forecast Year Households by Income and Per Capita Income – How much income do they make and will they make. 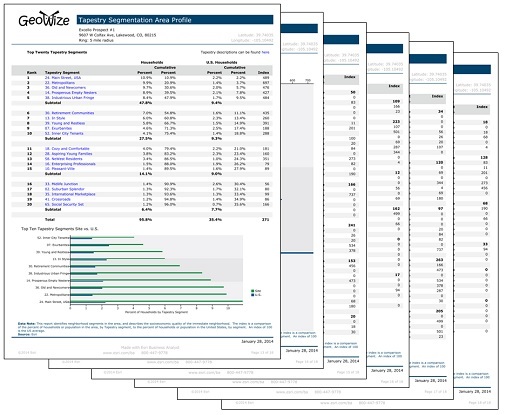 The Market Profile report provides a much greater amount of detail about each target area. Define the overall study area; gather competitor & feeder business data; map the associated business locations, and provide a keyed report with the detailed data. Gather key selection criteria and list out in a comparison table by site. Conduct a comprehensive study review session to explain all of the maps, reports & data to Elaine, and to answer all of her related questions. The Results – The data analysis has been integrated into a five year plan and the search for a suitable property is underway. Bricks and mortar is a big step. Building, buying or leasing a facility to expand your business is a major decision. Before committing to this kind of investment, make sure you have all of the data needed to guarantee your success! You can’t afford to pick the wrong location. 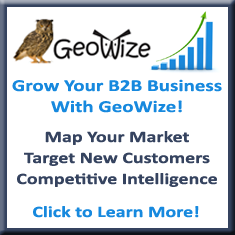 At GeoWize, we can not only provide the information you need, but we also help you understand the data and how to apply it to your unique business.